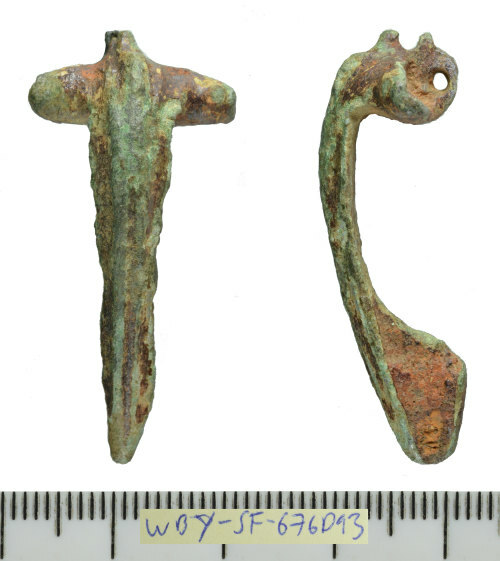 A mostly complete cast copper-alloy two-piece bow brooch of double-lugged Colchester Derivative type dating to the Roman period, c. 43-100 AD. Only the pin mechanism, pin and part of one lug are missing in old damage, the rest of the object preserved intact. It demonstrates a hemispherically sectioned winged head (the latter undecorated), with a projecting double-lug at the midpoint of its rear face. The bow is 'D' shaped in section and tapers long its length, demonstrating a prominent longitudinal moulded crest that runs down its middle. At the foot of the brooch, the catchplate projects from its rear, being triangular in plan with a rolled back edge (now filled with ferrous corrosion products) to accomodate the original pin. Preserved in fair condition with an even greenish patina, it measures 36.67mm in length, 17.42mm wide at its head, and 2.89mm thick at the midpoint of the bow. It weighs 5.41g.